Intel is adding a pair of new features to chips used in notebooks and netbooks, one of which will allow the devices to turn on within five to six seconds after being put in hibernation mode. Intel demonstrated the new features on Tuesday at Taipei’s Computex trade show. Intel’s Rapid Start Technology allows for faster turn-on by writing the PC’s application state to a dedicated flash drive. By doing this, the PC can quickly reload to its that state without rebooting, even if the battery is removed and then reinserted. The other feature, Intel’s Smart Connect Technology, updates content continuously on the PC while it’s in standby mode. The PC will periodically “wake up” and check for e-mail and other information like Twitter posts, and then fall back to standby mode. The new features will be incorporated into the company’s Sandy Bridge chip, the second generation of its Intel Core processor family, by the end of this year. (Sandy Bridge processors from Intel power the latest iMacs and MacBook Pros from Apple.) The chip maker will also be adding the features to its Cedar Trail microprocessor, which is designed for netbooks. Intel has previously said Cedar Trail will ship next year. Standby and hibernate are two modes on Microsoft Windows that allow users to power down their PCs. Standby mode runs on very low power, but is quicker to reload once brought back on. In contrast, hibernate offers greater power savings, but is slower to reload to its previous state since the mode shuts down the computer. 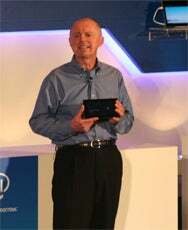 Intel’s Executive Vice President Sean Maloney introduced the features during a speech at Computex, and said they were in response to tablet devices. “One of the things we’ve learned from tablets is the vital importance of system response time. Users simply do not want to wait for a device to boot up,” he said. Tablets represent a market that Intel has been late to establish a presence in. Currently, most tablets, along with smartphones, use processors by Intel’s rival ARM Holdings because they are considered more power efficient. Intel executive Sean Maloney holding up a tablet using the company’s Medfield chip at the Computex trade show in Taipei. In response, Intel has been developing its own low-power chips with its Atom processor line. During his speech, Maloney briefly showed off prototypes of an Android tablet and smartphone using the company’s Medfield chip. The first products using the Medfield chip are expected to ship within six to nine months. At the same time, Intel already has several vendors like Fujitsu, Toshiba, Lenovo, NEC, Dell, ViewSonic, along with others developing tablets using the chip maker’s newest Atom processor, known as Oak Trail, announced in April. Thirty-five tablets will be released using the new chip, according to Intel. Several of those tablets were shown at Computex running Android, Windows 7 and Intel’s own operating system, MeeGo. Intel has said all three operating systems will be able to run on the same tablet very soon.